Get Cantonment Board Clifton Jobs 2019 Karachi Employment Opportunities from this page. 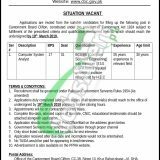 Applications are invited for the under mentioned posts by the Karachi Cantonment Board Clifton, CC-38, Street 10, Kh-e-Rahat, Phase-VI, DHA, Karachi from suitable candidates to apply against the following position such as (Computer System Analyst (BPS-17)). The following post shall be on contract basis which is extendable on satisfactory performance by the appointee. Candidates willing to apply for these positions should hold relevant qualification and experience as per the demand of vacant positions and according to the criteria candidates holding a qualification from BCS/BE (Computer Software Engineering) with minimum 3.0 CGPA from a reputed university are eligible to apply for the relevant posts. Serving candidates should apply through proper channel. The age of applicant should be 30 years. So, only eligible candidates meeting criteria should apply as per the following how to apply procedure given below. Interested candidates may send their Bio-Data along with attested copies of Educational Qualification and other all supporting documents to the Cantonment Executive Officer, CC-38, Street 10, Kh-e-Rahat, Phase-VI, DHA, Karachi. The application received after the scheduled date, incomplete or without essential documents shall not be considered. The last date for submission of application is March 19, 2019. Position applied for should be mentioned clearly on the application. The date and time of test/interview, as the case may be, will be informed separately only to the candidates found eligible. No TA/DA shall be paid during the recruitment procedure. For more jobs please visit our site JobsAlert.pk. Address: CC-38, Street 10, Kh-e-Rahat, Phase-VI, DHA, Karachi.